This past weekend was the Marine Corps Marathon 10k (known as the MCM10k). Hubby and I set the alarm for 6:15am, which is earlier than we both get up for work and a very painful wake-up time on a Sunday morning. We spent the next half hour waking up, putting on race clothes, drinking some water, and eating the little bit of “fuel” that we could stomach that early before we headed to the metro. We were on the National Mall in time to see the sunrise over the Smithsonian Castle, which was beautiful, although very cold, to watch. We clung to our sweatshirts, turning them into the baggage claim at the last minute before heading over to the start line. From that point on, it wasn’t long until the race got underway. For those of you who are runners but have never run the MCM10k, I highly recommend it! You essentially run the last 6.2 miles of the Marine Corps Marathon, including the killer uphill finish that is lined with Marines cheering you on. This was my first long race since my hip surgery, and I’m so glad I did it. Sure, my hip and my leg muscles are still feeling it a couple of days later, but it’s a good race. I was mentally and physically in a good place the whole time, and now I’m pampering myself with a little recovery time before lacing up the running sneakers again. Unfortunately, though, the race was the start of our day on Sunday, which meant several hours of grocery shopping and other errands before Hubby and I could finally relax on the couch to recuperate. When we finally finished, we grabbed some pizza and beer at one of our favorite local spots and then came home to watch Boardwalk Empire and The Walking Dead. Earlier in the day, I bought a couple of beers that felt “Halloweenish,” and, for me, there is nothing like drinking beer on a day that I’ve been running, so I was excited to open one of them up while we settled in for the evening. The Dead Guy Ale (brewery) is a German Maibock from Newport, Oregon. The beer had a dark cooper color with a think, foamy, cream-colored head. On the nose, there was a doughiness mixed with some caramel and hints of apricots. In the mouth, there is caramel mixed with bread. The beer was medium bodied. Is this worth a glass after work? Definitely! If you see this beer in the store, grab it; you won’t be disappointed. At $10 for 650ml, this beer wasn’t overly complex, but it was a solid, enjoyable choice. It had a strong maltiness with just a touch of hops peaking through to give it a brightness that wasn’t too bitter, but that lingers on the finish. I drank it with a leftover piece of white pesto pizza, and while that may not have been the best pairing, there is no doubt that this is a food-friendly beer. The one caution I have is that it’s very drinkable, so don’t be surprised if you find your glass is empty sooner than you expected. 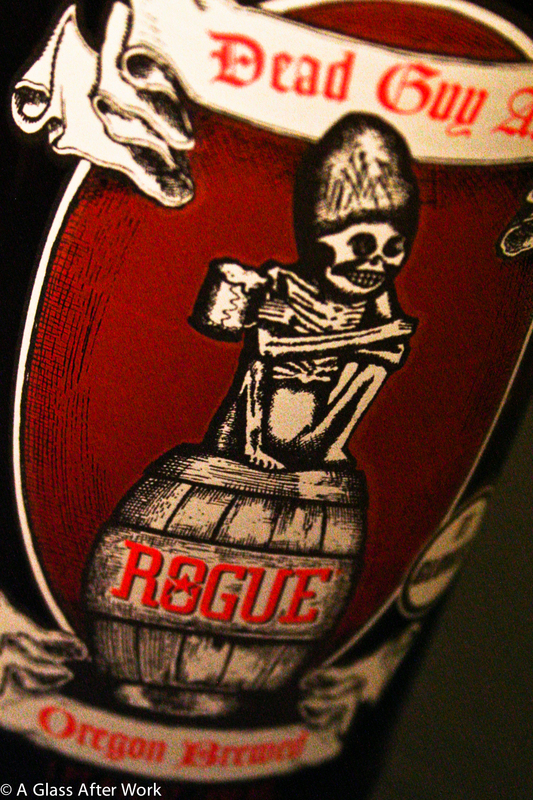 Question of the Day: Have you had any of Rogue Ales? Do you have a favorite?